On March 31, 1776 Abigail Adams wrote a celebrated letter to husband John, who was in Philadelphia serving in the Continental Congress, which would produce the Declaration of Independence three months later. In an age when women were seen as strictly domestic beings, the letter shows Abigail's boldness and insight as she urged her husband Remember the Ladies, to grant women more rights, as he helped shape the new national government. Sarah Wentworth Morton, poet of the American Revolution, is remembered for the long, sentimental, narrative poems in which she considers the make-up of the new nation, inter-racial relationships and heroism, both male and female. In her own time she was renowned for her poetry about the virtues of freedom. Though too invested in the idea of submission to be a feminist, she had the status and role of women very much at heart. Sarah Apthorp was born in Boston, Massachusetts to the wealthy Boston merchant, James Apthorp and Sarah Wentworth Apthorp. She was baptized at King's Chapel on August 29, 1759 (the exact date of her birth is unknown). Her family eventually numbered eleven children. In 1763 Theodosia Bartow married James Marcus Prevost, a British Army officer with whom she had five children. They lived in Bergen County, New Jersey, in a home they named the Hermitage. In 1776 James Marcus was called back to active duty in the Revolutionary War, while Theodosia tried to keep their home from being confiscated by the American government. Meanwhile she began a relationship with a young American officer named Aaron Burr. After her husband's death in 1781, 35-year-old Theodosia Prevost, with five children, married 25-year-old Aaron Burr. This portrait was painted in Philadelphia three years before she met and married the older William Byrd III. Mary Willing was born on September 10, 1740, the daughter of Charles and Anne (Shippen) Willing. Her father was the mayor of Philadelphia, Pennsylvania, from 1748 to 1754, and her great-grandfather, Edward Shippen, was the second mayor of Philadelphia from 1701 to 1703. Benjamin Franklin was one of Mary's godfathers, and when she was a child, he sent her books from Europe. Anna Hyatt Huntington sculpted this bronze statue of Sibyl on her horse Star; it was dedicated in 1961 on the shore of Lake Gleneida in Carmel, New York with smaller replicas in Danbury and at the Washington, DC headquarters of the Daughters of the American Revolution. Sybil Ludington was the daughter of Abigail and Henry Ludington, born April 5, 1761, in what was then known as Fredericksburg, and is now known as the Ludingtonville section of the town of Kent, New York. Sybil's parents met when he was on his way to Quebec with Connecticut troops during the French and Indian War. On May 1, 1760, Henry and Abigail were married. Mary Lindley, born in 1726, was the daughter of Thomas Lindley, a Quaker and blacksmith who had arrived in Philadelphia from Ireland in 1719. In 1727, with a group of other Quakers, including some of the most prominent merchants of the colony, Thomas Lindley became a founding owner of the Durham Furnace on the Delaware River in Bucks County, a 6000-acre iron ore site and one of the leading forges in the colonies. After the British had captured Manhattan Island, she delayed the enemy officers at her home. Her clever diversion permitted American troops to escape. Robert Murray (1721-1786) was born to a Presbyterian family in County Armagh, Ireland, and his family emigrated to America in 1732. While still in his teens, Robert became the operator of a mill in Swatara, Pennsylvania. Lydia Mulliken was born sometime in 1753. Samuel Prescott was born in Concord, Massachusetts, on August 19, 1751. He had an older brother, Abel, Jr., and a sister, Lucy. In those days, there was no medical school, so young Samuel apprenticed with his father, Dr. Abel Prescott, for seven years. He opened his medical practice in Concord shortly before the Revolution. Sometime during his apprenticeship, Prescott became an active member in the patriot movement and joined the Sons of Liberty. As a physician, he was exempt from serving in the militia, but he volunteered as a courier and delivered messages for the Committee of Correspondence. On April 18, 1775, British General Thomas Gage sent 700 British soldiers to seize colonial arms stored at the town of Concord, some twenty miles outside Boston. On the way they would march through Lexington. The Patriot spies soon got the word out. Local school children collected money to have this statue of Elizabeth Zane placed at the entrance to the cemetery. Elizabeth Zane, better known as Betty, was born on July 19, 1759, in Moorefield, Virginia. She was the daughter of William and Nancy Nolan Zane. Betty moved with her family at an early age to the area that now is Wheeling, West Virginia. Betty's older brother, Ebenezer Zane, pioneered this area in the turbulent Ohio Valley, which was the home of Native Americans who became increasingly hostile because of encroachment on their lands. These colonists were defying a royal order that reserved land west of the Appalachian Mountains for Native Americans. The threat of attack increased as the American Revolution began back East: the tribes who lived beyond the Appalachians understandably wanted the British to put down the rebellion, and almost all of them allied themselves with the British. The Zane family and a few others established Fort Henry, named for Patriot Patrick Henry, in 1774. Fort Henry was a parallelogram, 356 feet long and 150 feet wide, on a hillside overlooking the Ohio River, standing at what is now Tenth and Main streets in downtown Wheeling, West Virginia. The fort was surrounded by a stockade fence twelve feet high, and had a three-foot walkway running around the inside. It was practically impregnable as long as supplies lasted. The fort covered about three quarters of an acre of ground, and had a block house at each corner, with lines of stout pickets about eight feet high, extending from one to the other. Within the enclosure were a number of cabins for the use of families, and the principal entrance was through a gateway on the side next to the straggling village. 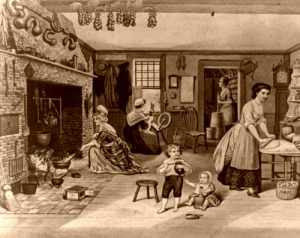 While living with the daily reality of a terrifying attack, the women of Wheeling also were busy with cooking, washing, sewing, weaving, and other household tasks without the supplies that most housewives could take for granted. While men hunted and fished for food, frontier women grew vegetables, tended to livestock and poultry, and often did other farm work. Betty's family sent her to school in Philadelphia, but she returned to Wheeling in 1781, the year that Americans won the important Battle of Yorktown. The war was not yet formally over though, and especially on the frontier, an alliance of British Canadians and Native Americans would continue to fight settlers until after the War of 1812. Deborah Sampson was born in Plympton, Massachusetts, on December 17, 1760. Although her family name was originally spelled without the p, it is under this spelling that she is most commonly remembered. She was the oldest of seven children of Jonathan and Deborah Bradford Sampson, both of old Colonial stock. Mrs. Sampson was a descendant of William Bradford, once Governor of Plymouth Colony. Jonathan Sampson abandoned his family and moved to Maine, where he continued to live in poverty. Her mother was of poor health and could not support the children, so she sent them off to live with various friends and relatives. Deborah, aged five, was taken by a spinster, and she was then sent to work in the home of the elderly widow of the Reverend Peter Thatcher. Betsy Ross was born Elizabeth Griscom to parents Samuel Griscom and Rebecca James in Philadelphia, Pennsylvania on January 1, 1752, the eighth of 17 children. 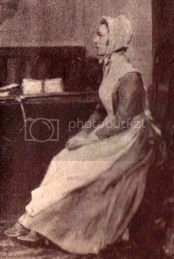 She grew up in a household where the plain dress and strict discipline of the Society of Friends (Quakers) dominated her life. One year before William Penn founded Philadelphia in 1681, Betsy Ross's great-grandfather, Andrew Griscom, a Quaker carpenter, had already emigrated from England to New Jersey. Andrew was of firm Quaker belief, and he was inspired to move to Philadelphia to become an early participant in William Penn's holy experiment. He purchased 495 acres of land in the Spring Garden section north of the city of Philadelphia, and received a plot of land within the city limits. Priscilla Scollay was born on August 15, 1755, in Boston, Massachusetts, daughter of John and Mercy Greenleaf Scollay. In 1761, along with about fifty other men, John Scollay signed a petition which was sent to King George III protesting the illegal actions of the British revenue officers. A strong supporter of colonial claims against the empire, John Scolly was chosen to Boston's Board of Selectmen in 1764. The honor was repeated in 1773, and the following year he was made chairman, a title he held until 1790. Scollay Square in Boston is named for her family. Wife of the Other Midnight Rider William Dawes, Jr.
Mehitable May was born in Boston, Massachusetts, on August 6, 1751, to the well-respected family of Samuel and Catherine May. William Dawes, Jr. was born in Boston on April 5, 1745, to William and Lydia Dawes in Boston, Massachusetts. He was a fourth generation descendant of the first Dawes in America, who came to Boston in 1635. William Jr. became a leather tanner and tradesman, and was active in Boston's militia. On May 3, 1768, Dawes married Mehitable May, who was seventeen. They would have six children together. At the time of their wedding, there was a boycott on British goods to pressure Parliament into repealing the Townshend Acts. Because of the boycott, The Boston Gazette reported that everything Dawes wore that day was made in North America. Joseph Growden built this home which was later expanded upon by his son Lawrence, Grace Growden Galloway's father. Grace later inherited this home, but since married women at that time were not allowed to own property, her husband Joseph Galloway automatically became the owner. One of the most interesting diaries written during the American Revolution was written by Grace Growden Galloway, while the world as she had known it was completely destroyed. Her family history was typical of colonial American families. Her grandfather settled in Pennsylvania and accumulated a large amount of property. His second son Lawrence sought his fortune as a merchant in England, where he got married. Lawrence's second child, Grace, was born in England in 1727.